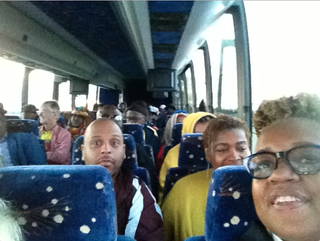 The People’s Organization for Progress, a New Jersey-based activist organization, on the way to the 20th-anniversary Million Man March in Washington, D.C., Oct. 10, 2015. The writer, Todd Burroughs, is in the front left seat. On the floor by my bed is one of the books that made me a journalist: Sylvester Monroe and Peter Goldman's Brothers. (Goldman, I would learn later, wrote the biography The Death and Life of Malcolm X.) The book told the stories of black men struggling to survive in Chicago and beyond. I moved it around this morning because I couldn't find my bus ticket for this Million Man March reunion. The Million Man March was an attempt by black men to write their own stories, in their own minds and hearts. What, then, is this 20th MMM reunion, "Justice or Else," about, really? Black men were considered an endangered species when Brothers came out in 1988, when the first MMM took place in 1995 and perhaps still now. Why do this? Perhaps it's necessary for blacks to subconsciously and literally travel to the altars that mean something to them. This one, the National Mall, is the site of a mid-20th-century African-American dream. As the ritual now stands, once folks arrive, the names of those who have joined the ancestors are called out loud. And so this assemblage—this time to specifically remember today's lynching victims and yesteryear's MMM spiritual power, when black men blocked out the white backlash over the O.J. Simpson verdict and the Newt Gingrich Republicans and repeated a chant from Minister Louis Farrakhan. The promise: to make themselves better. So the Million Man March joins the now-regular commemoration of the 1963 March on Washington. The original Black Panther Party has had reunions and will have its 50th anniversary next year. Why do black people find these activist reunions necessary? Because as an oppressed people, their transformation—hard earned through struggle—is more than deserving enough for nostalgia, for solemn reflection of battles lost and won. My ticket was found, and I'm now on the bus, struggling with the narratives to come.